When planning the decorations for a wedding, one of the decorations that can make the biggest impact on your guests is the wedding reception table decorations. At the tables is where the guests will be connecting with friends and family and where they sit is like "their spot" at the wedding. So the centerpiece at the table is the decoration they may be most connected to. There are endless possibilities for centerpieces but one of my favorites is miniature trees. A tree is a common theme in weddings and holds a lot of traditional wedding symbolism with its strength and form. 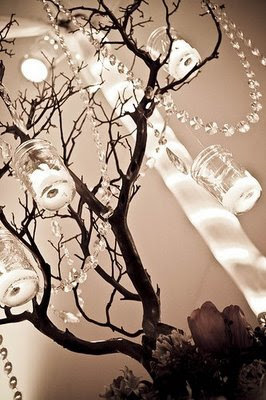 Small manzanita branches can be bought fairly inexpensively and transformed and decorated to fit just about any theme. One of the most elegant ways to decorate these trees is to hang crystal from them, but the different things you can decorate them are almost endless. The trees can be painted to any color but are sometimes more beautiful with their natural reddish bark. Larger trees can be used for other parts of the wedding such as on a buffet table or even a central piece of the whole wedding decor. The larger trees surrounded by smaller trees on the wedding tables can compliment each other nicely. Manzanita trees are also a popular tradition as wishing trees for guests to hang their wishes, sometimes in the form of money, which is always nice. 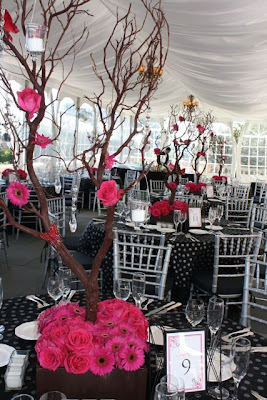 If you are trying to decide how to decorate your wedding, or one you are planning for someone, you may want to consider manzanita trees. They are very versatile and can be decorated from simple to elegant. The beauty and strength of these trees is also has great symbolism that is a great way to enter a marriage.